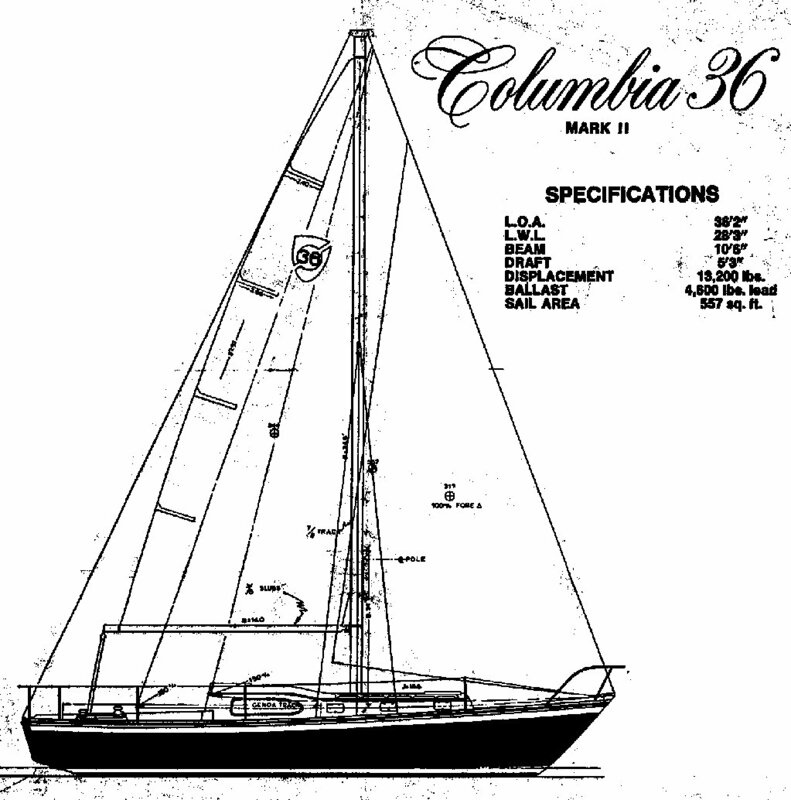 The Columbia 36 was available as a sloop or a yawl. 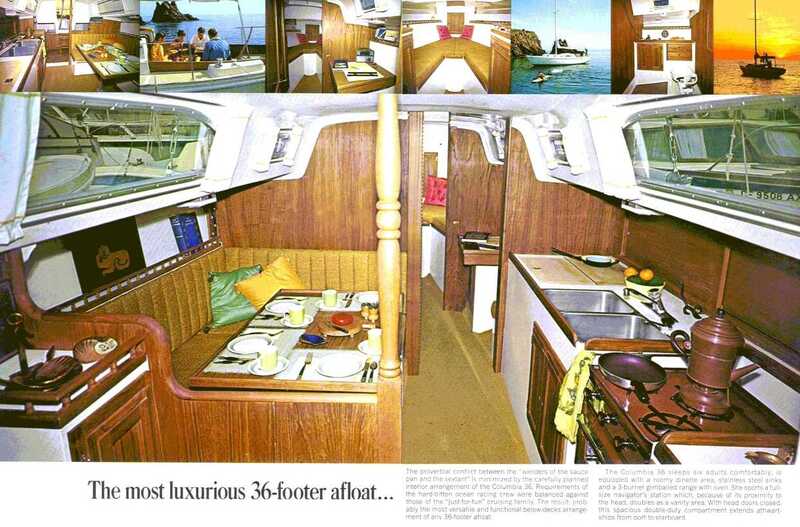 Length Overall:         35' 9"             36' 2"
Length Waterline:       28' 3"             28' 3"
Beam:                   10' 6"             10' 6"
Draft:                   5' 5"              5' 3"
Sail Area:             557 sq. ft.        557 sq. ft.
Displacement:       12,000 lbs. 13,200 lbs. Ballast:             5,000 lbs. 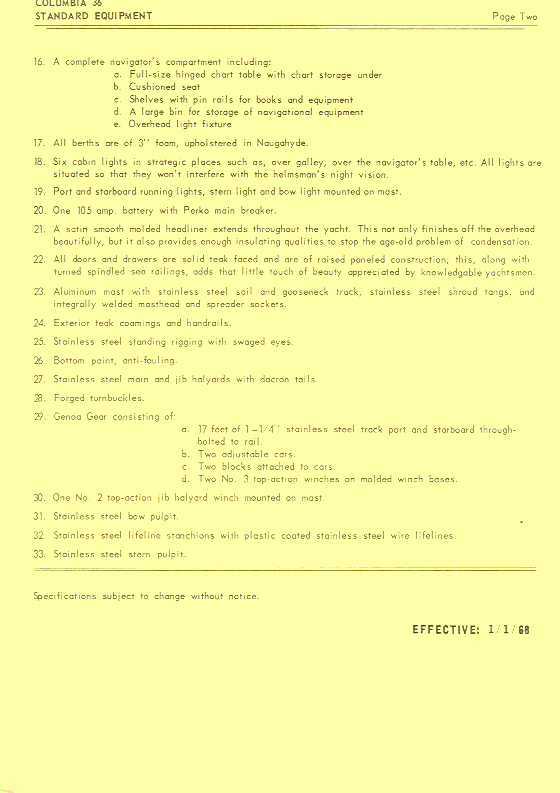 (lead)  5,000 lbs. On my C-36, the hull plate is easily found. Go to head, take a seat (with or without reading material), turn head 90 degrees to the right, your nose is pointing at it. 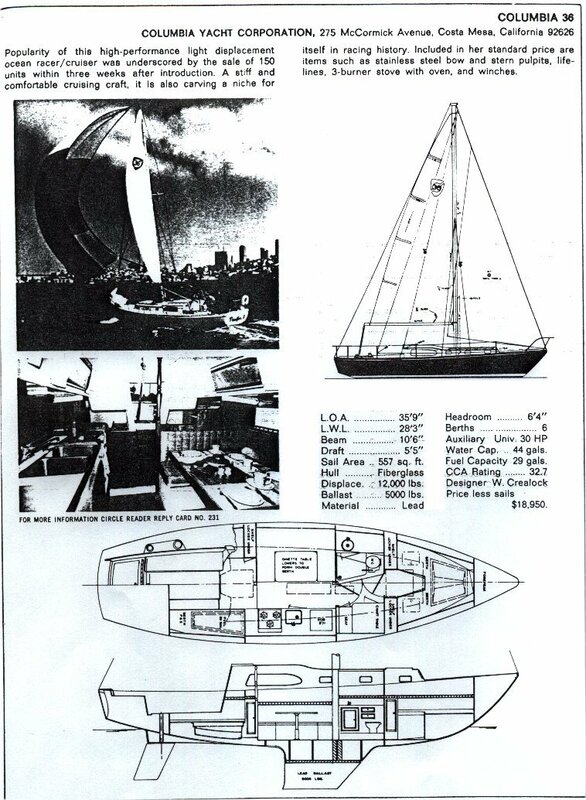 Years ago, when I was interested in buying a C-36, I talked to Bill Crealock, the designer. He said that when the boat was first offered, it had something like a Scheel keel to give it shoal draft. 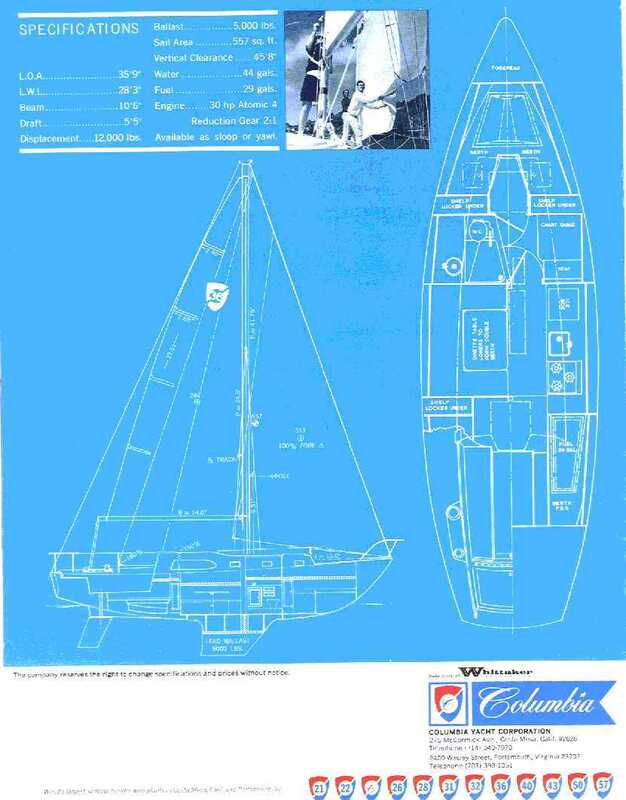 He had misgivings about the design of the keel and did the design with the understanding that, if it were not successful, Columbia would fit a more traditional keel to the boats. 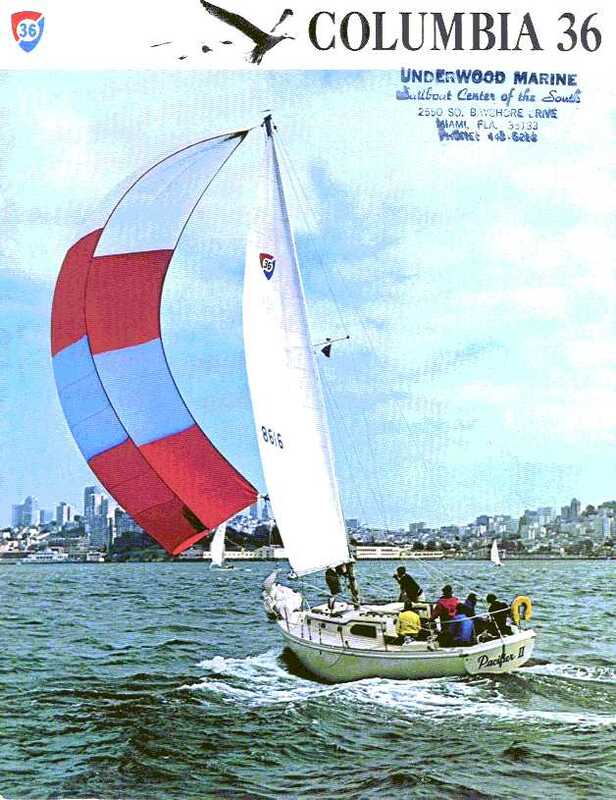 As it turned out, the "Scheel keel" didn't work very well and was replaced by a traditional design after some number of boats. I don't know how many, but it was something less than 50. 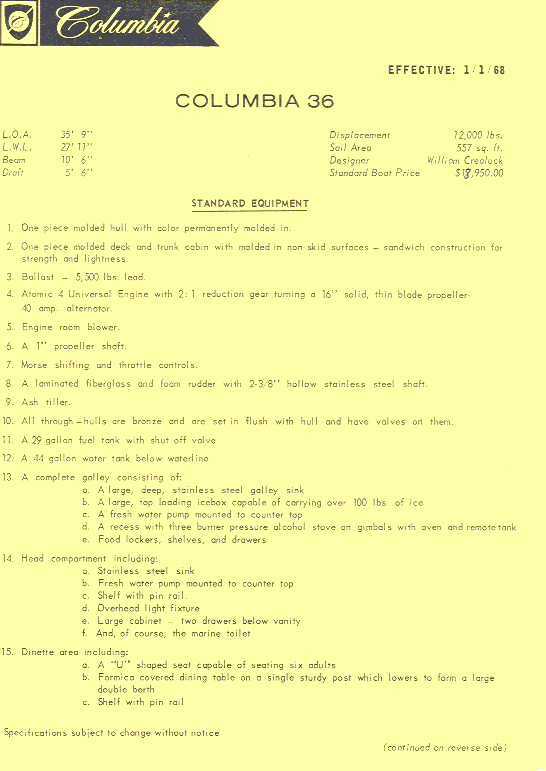 How does this relate to the "shoal draft option" you are inquiring about? I don't know that either, but maybe the're related. 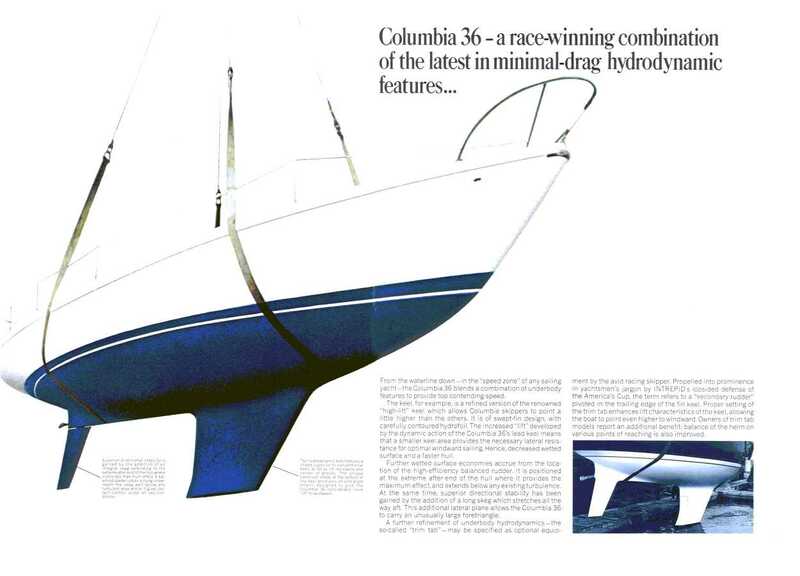 In May 1968 Columbia ads were still touting the ...advanced underbody concepts that include the latest in today's drag-reducing hydrodynamic achievements. By January 1970 Columbia brochures showed the inverted shark fin keel and 5' 3" draft. And how's this for an endorsment for a boat? Mine has ID of 2-7/16, OD of 2-5/8 and is slightly less than 4 inches tall. It "appears" to be made out of nylon or something like it. There is a nylon washer directly underneath the bearing that sits in a slight recess in the hull. This washer has 2-7/16 ID, 2-3/4 OD, and is 3/16 thick. This same washer or very close to it also sits on the top of the tube directly under the quadrant. 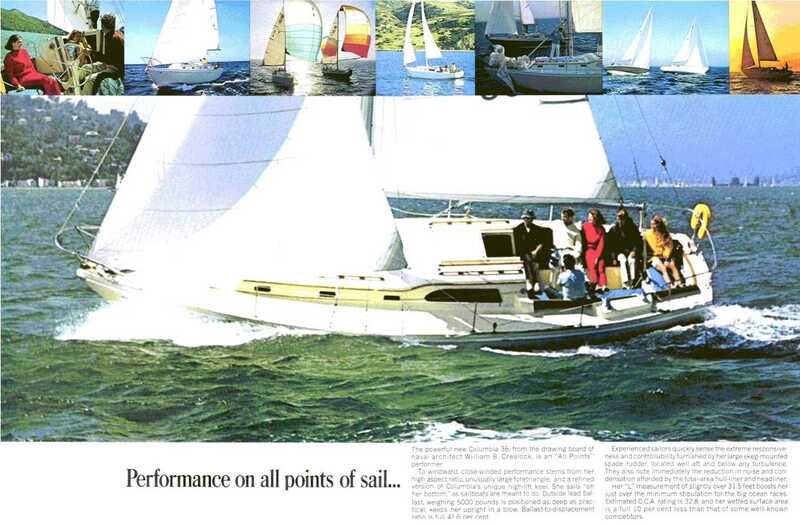 The above specifications also match very closely the sailcrafter manual for the C36. I would think my bearing probably started out with 2-3/8 ID and just got a little bigger over time. I have a minimal amount of slop in mine at the moment.